In 2012, 24% of Americans age 18 or older had visited a historic site in the previous year. This was 13 percentage points lower than in 1982, with the bulk of the decline occurring from 2002 to 2012. The data reveal generational differences with respect to Americans’ tendency to visit historic sites. 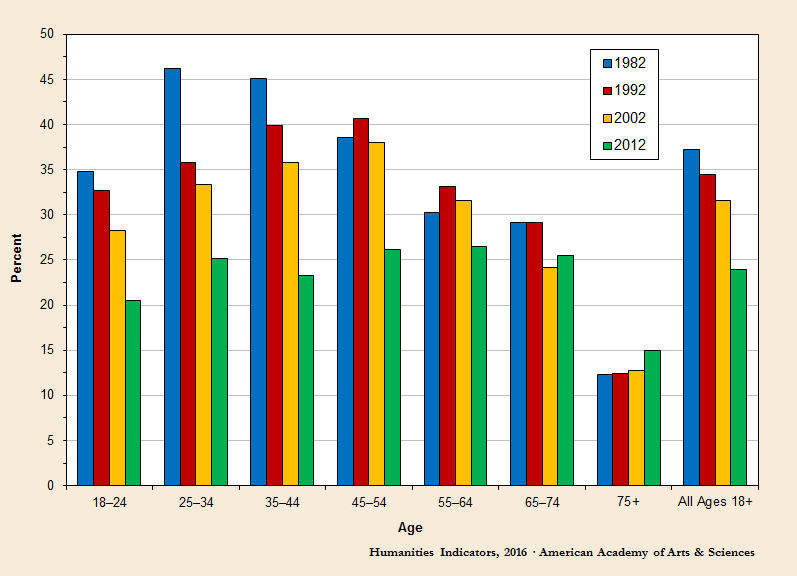 With each birth cohort, Americans of all ages have been less likely to visit historic sites. For example, those born from 1938 to 1947 had a 45% likelihood of having visited a historic site in the previous 12 months when they were ages 35–44, while those who were born in the 1968–1977 period had only a 23% likelihood of having visited a historic site when they were the same age. The survey question is broad: “During the last 12 months, did you visit an historic park or monument, or tour buildings or neighborhoods for their historic or design value?” It is not just about taking a tour of a historic house museum. The survey is a national aggregate. Much like the stock market, just because total visitation has declined doesn’t mean visitation at an individual historic site has declined. What is more important (and isn’t part of their study) is why people visit or avoid historic sites, or why some historic sites have successfully moved against this trend (and they are out there). For another take on this data, see “New Report Reveals Each Generation Less Likely to Visit Historic Sites Than the Last” on the AASLH blog. There is a companion study on arts museums which also shows a decline in visitation. So, I am not sure how to digest these studies. But what I do know is this: it was good to see you at Advocacy Day, Max. Just wished I could have visited with you more. The art museums and historic sites reports by AAAS are both based on the 2012 NEA study, which in a nutshell says attendance is declining, but it’s far worse for opera, ballet, jazz, and classical music (not part of the Humanities Indicators project). The only area that showed growth (other than the over 75 crowd, which may be a limited opportunity) is photography and videos (hmm, what can museums and historic sites do to take advantage of that interest…?). Good to see you as well at Museums Advocacy Day on Monday and wanted to chat, but geez, there were a lot of people in the room and I couldn’t even find a seat in the afternoon. Max, are people just switching to “virtual tours” on line as opposed to actually visiting the physical sites? We have become a society so focused on the computer screen in all areas that this could also apply to museum site visits. It would be interesting to track the number of hits on the various museum/monument internet sites as another indicator of interest. I did note that visits for the over 65 crowd shows an upswing. Perhaps online experiences are replacing on-site ones, and it’s what everyone wants to know (including retail stores) but the jury is still out. It may depend on the audience segment (e.g., seniors vs teenagers). I don’t recall any studies for historic sites on this topic, but Google just released, “Five Ways Consumers Connect to Stores with Mobile Shopping” that shows the connections between mobile vs physical shopping, and it may apply to museums and historic sites as well. For example, 50 percent of customers who conduct a search on their smartphone visit a store within a day, so could it be possible that online information about a museum or historic site could encourage people to visit? I guess it depends on what they find online–it’s now frequently used by shoppers to make a decision about where to make a purchase. Not sure what we’re doing right at the New Hampshire Bureau of Historic sites, other than aggressively using social media to connect with stake holders and advocates. We have grown visitation over each of the last five years and in some cases were up over a 100% over FY 2014. I’m speaking about the state owned and managed historic sites and resources. One critical move we made was expanding our site missions to include all that can be experienced at a site from as little as picnicking to outstanding seasonal striper fishing at the Wentworth-Coolidge Mansion and Fort Stark. Building new advocate groups by sensitively diversifying property use has by default grown visitation for what still is the core mission of teaching New Hampshire history through landscapes, architecture, collections and stories. By expanding our voice through social media, which includes in-house video, blogs and rapid responses to the publics questions, we’re able discover new user groups that we didn’t know we already had. Many of these groups tend to be younger, more politically engaged, educated and looking for healthy activities like hiking, biking and kayaking. One example I often use involves a simple trail we constructed through the maritime forest on the Wentworth-Coolidge Mansion property. We built the simple 1m trail to give folks who were waiting for a tour to start something to do. After the trail was complete and blasted out on social media, we had folks coming to use the trail first as a new local resource and then consider doing the house tour. We are always learning from our guests and try to react as quickly as we can. I manage 18 sites with 25 seasonal sites guides at five house museums on less than $200k a year. New Hampshire has the only self funded system in US.